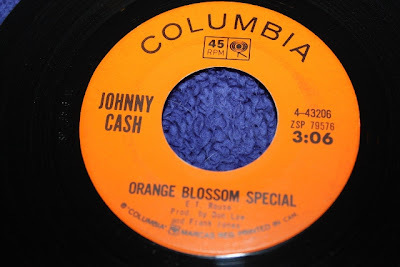 Maritime Vinyl: Johnny Cash - Orange Blossom Special! 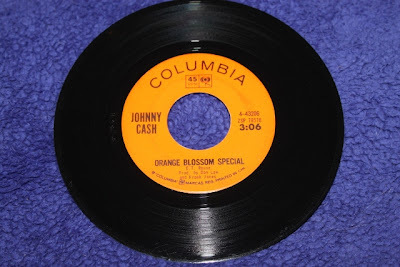 I’m always excited to find Johnny Cash records when hunting for vinyl and luckily in a recent dig I found a copy of the single Orange Blossom Special. Having only been familiar with Johnny Cash’s live version of this song on the At Folsom Prison LP, I was excited to hear his studio recording of this song. Orange Blossom Special was written by Ervin T. Rouse in 1938 and originally recorded with Ervin and his brother Gordon Rouse in 1939. People like me who are only familiar with Johnny Cash’s version know it as a harmonica heavy song. The original, however, was recorded an instrumental with the fiddle as the lead instrument even though Ervin had written lyrics. This original version is also quite a bit faster than Cash’s version, making it a pretty catchy bluegrass number. The fiddle imitates the sound of a train which I’m sure played a part in Cash covering the song, hence the whole “steady as a train” style he will always be remembered for. On the At Folsom Prison live version Johnny Cash continuously blows two harmonicas from left to right up the scales back to back, there was no real skill in this harmonica playing but it was the novelty effect that was appealing. In this studio version, the harmonica is played much more complex (played by Charlie McCoy rather than Cash) and it gives it a more detailed sound. Along with the harmonica, there is a saxophone present being played by Boots Randolph. Boots was well known as a part of the Nashville sound, recording with artists such as Elvis Presley, Roy Orbison, Jerry Lee Lewis and even REO Speedwagon. I wasn’t familiar with Boots’ work until I recently picked up a few of his albums in a collection which coincidentally also included this Orange Blossom Special single. It’s funny how I never hear of someone like Boots and then his name turns up continuously. This is the American pressing label (not my copy). The Canadian label is identical except the color. 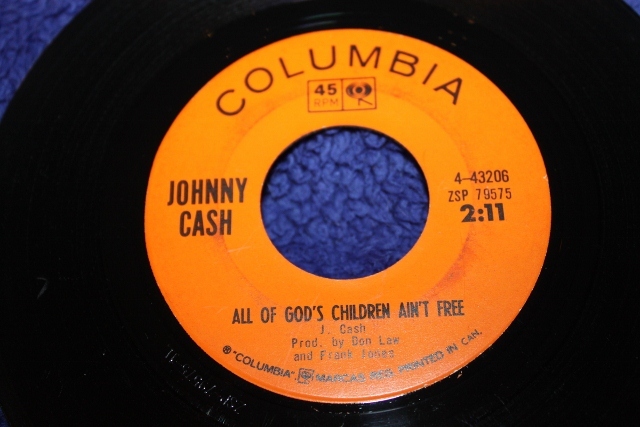 This is an original 1965 Canadian pressing of the single with Cash’s All Of God’s Children Ain’t Free song on the ‘B’ side. 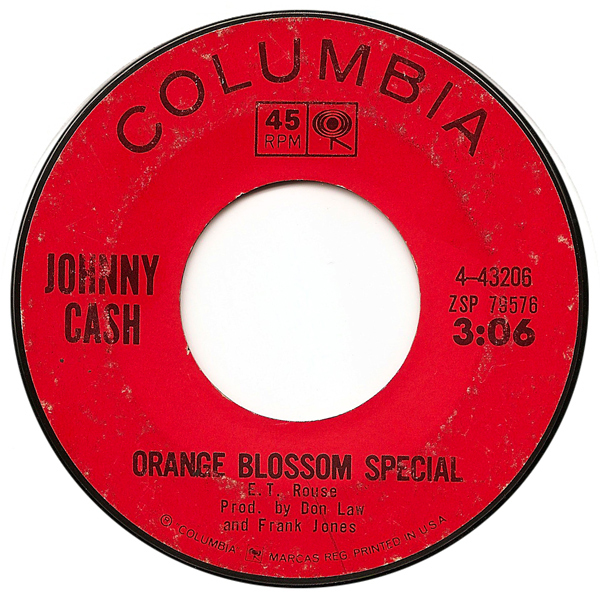 Columbia used this orange label starting in 1960. Aside from the color, this label is identical to the red US label used at this time. In my collection, the only thing better than an original pressing is an original Canadian pressing! It may not be a rare single, but important nonetheless being one of Johnny Cash’s best covers and most well-known songs.